Based in White Bear Lake, E & M formed as Daro Industries in 1977, specializing in commercial grade hinges for industrial applications like radiation shielding and soundproofing. Over the years, the company grew to add milling and turning capabilities. Daro Industries merged with All-American Engineering & Mfg. in 2004 and ultimately became E & M in 2017. Emmanuel Efiong and Matt Braund, then long-time employees of All-American Engineering & Mfg. were introduced to 21st Century Bank Commercial Head of Lending, Gregg Klohn through the Metropolitan Economic Development Association (“MEDA”), a nonprofit organization that provides assistance to businesses that are owned and managed by ethnic minority residents of Minnesota. In June of 2016, MEDA was aware of two things: E & M was going to need an SBA 7a, SBA 504 Specialist, and 21st Century Bank is among the top SBA 7a and 504 lenders in the State of MN year in and year out. The SBA 7a Program would be a requirement for the Business Acquisition and the SBA 504 program would be appropriate for acquisition of the building from which the business operated. 1) Business Acquisition equates to a transition of cash flow, which always carries some amount of risk. 2) Cash down payment from the prospective owners for both the business and building purchase were limited. Therefore, MEDA would be supporting the buyers with this need, up to the 10 % limit available. 3) Working capital for the business would be a part of the loan structure, as the Guarantors had limited personal capital to put into the transaction. 1) They were a minority-owned business with MEDA support. 2) The cash flow stream being purchased was produced by another party, and thus, there is transition risk. The risk of this was mitigated by the fact that the new owners were long-time key employees of the business. 3) A high percentage of Business Acquisitions lack hard collateral—this is a manufacturing business that has a lot of hard assets that hold their value well. 4) The building was transacting at a fair price. Guarantors that lack the ability to fund working capital. This is a textbook SBA 7a loan. 21st Century Bank also does Building Acquisition loans that only have minimal capital available for down payments. The Bank utilized the SBA 7a program to finance the purchase of the business. Although there was no collateral shortfall involved, (which is a common reason to utilize this program), we had a business transition, minimal capital for down payment, minimal personal capital for growth, and the minimal down payment that was available was coming from subordinated owner financing. This was also a great product given the situation as a 10-year amortization is one of the terms of this product. A conventional loan would likely be a 5-year amortization. The SBA 504 program was selected for the building purchase. Conventional loans are normally 20 % down, and with only 10 % of capital available for the down payment, SBA 504 becomes the best product fit. Additionally, they received the benefit of 40 % of the funding for the project (funded by an SBA bond) fixed for 20 years at a reasonable long-term rate. As a review, this process began in October 2017 as a reminder; negotiations on purchase prices of the business/building were not finalized at that point. Negotiations and finalization of both the Purchase Structuring and MEDA for the down payment took place until November of 2016. Submittal to the SBA for approval and closing occurred by February of 2017. Beginning to end, the process took eight months—5 months to negotiate and structure the purchase and 90 days to close both the SBA 7a and 504 loans. 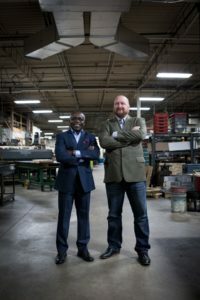 Emmanuel and Matt were able to get support from 21st Century Bank and MEDA to accomplish their goal of buying both the business and the building. In addition, they have added an additional four employees since the acquisition. 21st Century Bank was able to demonstrate its abilities in the origination of SBA 7a, and SBA 504 lending one more time and ended up with a great future customer.